Can This Plate Be Saved? So, you have a favorite plate or you are thrifting and you come across a plate that looks like this one. Can the crazing be removed? Is the piece useable? Well, it depends. In the case of this plate, the stain can not be removed because the damage is too deep. In fact, the crazing is evident on the underside of the plate. 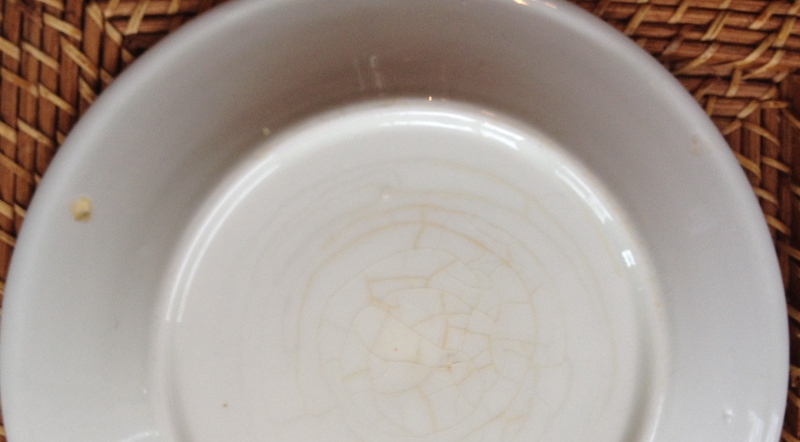 Also, note the kiln marks – one of them was not glazed before it went into the kiln. Over time, the unglazed spots are infiltrated by all that was served on the piece. Here you can compare two kiln marks – the mark on the right was glazed. But many times, if the problem is only surface deep then the Hydrogen Peroxide Bath usually will clean it up! It is really a miracle – of science. So, toute de suite, are the detailed instructions from The White Ironstone China Association – and even though restaurant ware is glazed, fired and finished differently – this recipe works. 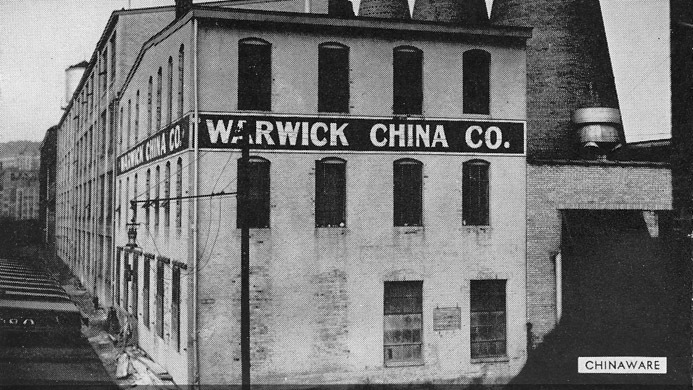 Silverware can leave gray marks on china. Use a little toothpaste on a soft cloth to rub them away. 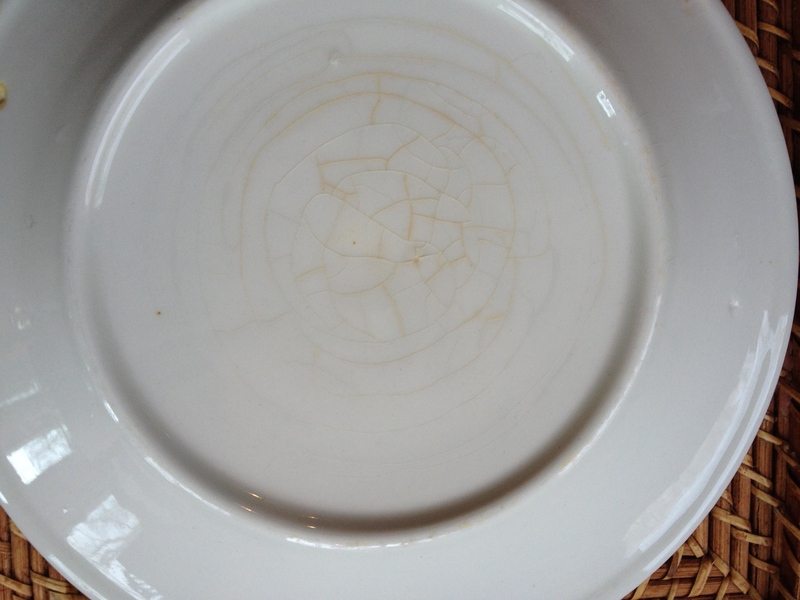 Some of the most common stains seen on white ironstone china are dark staining under the glaze. Sometimes the whole piece can look dirty, and often a buyer won’t think of purchasing it. Some stains have gone deeply into the clay itself, and won’t come out, but quite often they can be removed quite successfully. Common cleaners that will remove some stains include naval jelly & ZUD (rust stains), denture tablets, calgon water softener with a Z code, and ammonia (sealed in plastic). You don’t see professional cleaning instructions here because of the danger involved – chemicals can explode, and they can cause injury. There are people who do professional china cleaning, and it can be well worth it to engage them to clean valuable pieces for you. The only relatively safe chemical that we know of to clean white ironstone china is hydrogen peroxide, and it is used frequently. Its chemical formula (H2O2) is very similar to water (H2O), but it has an extra oxygen atom. This gives hydrogen peroxide the ability to oxidize organic and inorganic materials, producing water at a reaction byproduct. This makes it useful as an agent to both whiten the stain and make the stain easier to be flushed from the china. If you want to try cleaning a piece with hydrogen peroxide, by the regular 3% hydrogen peroxide in the grocery or drug store. Buy enough to cover your piece as you soak it. Put the peroxide in a tightly lidded plastic container. After several days, take the piece out and put it in strong sunlight, so the hydrogen peroxide vaporizes from the heat. You can also try to bake the piece in an electric oven, at the lowest possible temperature, not to exceed 200 degrees. Using a gas oven could cause a fire or an explosion when the hydrogen peroxide is heated. Heating in an electric oven is safe to you, but your dishes could very well break. Heating in sunlight takes longer, but is safer for the dishes. You can repeat this process until the piece is clean. WARNING!! Using a stronger solution of peroxide is extremely dangerous. It can burn the skin off your hands and cause permanent damage to mucous membranes, and unless you know chemistry very well you could have an explosion. Leave the work with stronger hydrogen peroxide to the professionals. After you have cleaned your white ironstone piece, wash it thoroughly, as any cleaning chemicals that remain can migrate into your food. One of the most common mistakes is to use Clorox or some other chlorine bleach to attempt to clean white ironstone. You may get rid of the stain, but you likely also will ruin your dish. Chlorine gets under the glaze and has a chemical reaction with the clay and glaze. Chlorine bleach has the ability to exist in several states, liquid, gas and crystal. The bleach penetrates the glaze and goes into the clay body. There, when it dries, it turns into crystals, which expand and will push the glaze right off the piece. The clay body of the piece is dissolved by the chemical, and the ironstone breaks back down to clay particles. You will sometimes find a piece of white ironstone that is covered by a white powder. It may have been cleaned with bleach. Often these pieces will smell like chlorine bleach, and the surface is crumbling to the point where the glaze is coming off. Over time, the piece will continue to deteriorate, and eventually the clay body will begin to crumble. Soaking the piece in vinegar will stop the deterioration, but won’t repair the damage. If you know of any tricks of the trade – like a process or recipe to clean wood with built up wax and dirt – let us know!